As a small business, you need to conduct research that is effective, and easy to do. Large companies will use surveys, focus groups, interviews and more. And may target hundreds of thousands of people. As a starting business you probably don’t have the budget, time or resources for this elaborate analysis. Your goal is to listen to what your potential customers ask for, comment on, and complain about. This provides the information to create a product or service that solves a problem and the market values and will purchase. Here’s how you can easily and cheaply get insights about your market. Quora is a question and answer platform. Users can ask questions on any topic. You select a topic relevant to your business and see what questions are being asked frequently. You can see what answers are being given and can answer some yourself. Let’s look at an example from my business. Since I’ve identified starting a business as one of my topics, I see questions about starting a business, growing a business, marketing a business, and more. This gives me information on what people want to know and helps me understand and target my audience. I know there’s a market for this subject by the questions they ask and the number of times I see the same type of question. 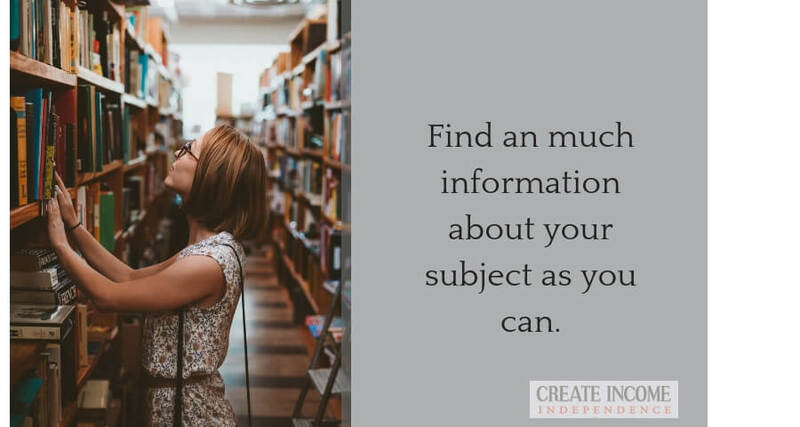 The specific questions pinpoint what information is missing, or they want more of, that I can provide. Reddit is the sixth most popular website with 330 million active users. There are over a million subreddits, so any topic you want to research is available. Search Reddit for your topic. Look at the questions being asked and see what struggles the posters are talking about. Now, look at the comments. Other people will respond with suggestions, things that worked and didn’t. and possible solutions. These conversations will provide insight into the needs of your audience. Continuing with my own example. I found these questions: How do I start a business? What questions do I ask before starting a business? How can I find business ideas? How do I start a business while having a job? These represent the pain points of many people and a direction for me to provide a service that can help. Facebook is an important community platform. Type your topic into Facebook search and find groups relevant to your niche. Join closed groups that are relevant to your industry or topic. Once you’re accepted, read through the discussions and you’ll see what concerns members have. This is an excellent resource because people are more willing to get into the details of their problems when they are in a private group. Notice what questions they’re asking, what language they use, and how they talk about the topic. After you’re in the group and feel comfortable, start participating in discussions, asking and answering questions. You will learn a lot by seeing what other members say. When you become a recognized name, you can ask for specific feedback or for volunteers to take a survey. This is a technique I like. Search out similar products or books relevant to your topic. Read the reviews, both good and bad. This provides great market research as potential customers are telling you what they like, what’s lacking, and many times they reference things they think are better. These unsolved problems gives you the knowledge to create the solution. In addition, Amazon gives you similar products or books that others are buying. This can provide a wealth of information. If you have existing customers, or a group of people you know are interested in your new offering, you can use a survey or an interview. If you use a survey, keep it brief. Ask only the questions that will get you relevant information. People are more likely to participate if you ask just a few questions that are easy to answer. Interviews provide in-depth insights. Many times a customer can’t identify what they want, but the value is to get them to detail their pain points, frustrations, and goals. If you can get interviews from even a small number of clients the actual words they use to describe their issues can be gold. You’ll understand their issues better than you can with most methods and will be able to use the customer’s exact language in your marketing. Online forums are another good place to tune in to your customer’s conversations. To find a relevant forum, go to Google and type in your proposed topic followed by the word forum. In my example, it would be “starting a business forum”. Once you find an active forum, you’ll see the words people use when talking about your topic. These words and phrases will become the keywords you use to do further research. Keywords are defined as the actual words your customers use when they search for information. Since you’ve done all the social listening necessary to understand your customer, you should have identified several relevant keywords that match what you want to offer. Even if you’ve narrowed your business to a specific keyword you will still have competitors. That, of course, is a good thing. Not only does it confirm there’s a market for your idea, but you can learn by watching what the competition is doing. In the next section, I’ll discuss how to find your competitors and learn from their experience. Here’s where that list of keywords you assembled is used. Put your keywords into a Google search and see what sites come up. Pick the ones you view as your closest competition and look at what they offer, what they write about, what problem they’re trying to solve, and what they charge. Determine who their customers are and what those customers say. From here you can design your products or services to meet the void you found exist. You can more precisely pick the keyword you want to rank for and structure your website to offer what the market wants. All these techniques are meant to accomplish two things, find out what problems your potential customers have so you can give them a better product or service. Second, find your competitors to see what they are doing and where they are lacking so you can fill the gap. If you need help finding an idea to start your business, check out the Idea Finder Course and Brainstorming Session. Already have a business and want the insights, brainstorming, and support of your peers? The Business Start-up Mastermind Group offers the help of a small group of like-minded people. Have you done research for your business? Did you use any of the methods described in this post? Are you stuck getting the information you need?